LONDON--(BUSINESS WIRE)--Technavio’s latest report on the global application development and integration market provides an analysis of the most important trends expected to impact the market outlook from 2017-2021. Technavio defines an emerging trend as a factor that has the potential to significantly impact the market and contribute to its growth or decline. With the emergence of new technologies such as analytics, artificial intelligence, IoT, machine learning, and cloud computing, the demand for application development and integration services had been significantly increased. Enterprises are subscribing to application development service to build applications for new technologies. Buy 1 Technavio report and get the second for 50% off. Buy 2 Technavio reports and get the third for free. Cloud computing solutions are widely being adopted in organizations to modernize IT infrastructure through cost-effective and flexible solutions. Cloud computing solutions help organizations to move their SCM systems from on-premises to cloud computing model, to integrate with other back-office systems. “Cloud-based platform solutions enable enterprises to integrate back-office systems efficiently. The popularity of cloud-based application system integration services is increasing due to their faster connectivity features to run multiple applications,” according to Amrita. The rising popularity of e-commerce transactions in business-to-business (B2B) and business-to-consumer (B2C) segments has created complexities in back-office operational processes. Organizations that provide e-commerce services are also required to connect their back-office and front-office database management systems for exchange of information. E-commerce firms are using application integration solutions to integrate their back-end systems with enterprise systems, as well as with front-end systems. Back-end system integration with e-commerce applications helps firms to reduce IT expenditure by connecting front-end and back-end systems together. Hybrid integration services are integration solutions that are a combination of on-premises systems and cloud-based. Hybrid integration architecture combines applications that are run on a cloud platform and on-premises. The key benefit of hybrid integration solution is that they provide accessibility for users to access on-premises data as well as data stored on cloud-based applications. Hybrid integration services save the cost of legacy systems by integrating new applications on the existing platform. Hybrid integration technology supports BYOD programs, which are getting recognition in organizations to minimize capital expenditure. 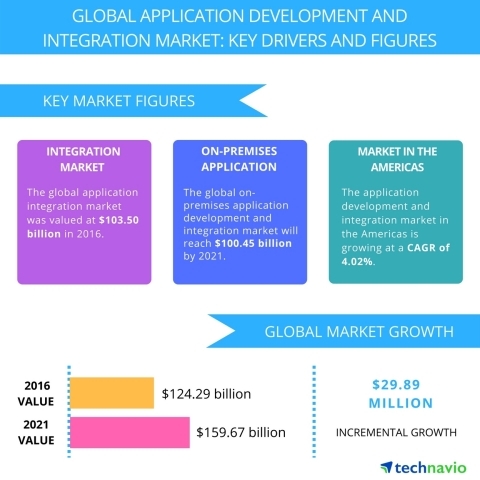 Technavio’s report on the application development and integration market provides an analysis of the key trends expected to impact market outlook.